Gorillas are ground-dwelling, predominantly herbivorous apes that inhabit the forests of central Sub-Saharan Africa. The genus Gorilla is divided into two species: the eastern gorillas and the western gorillas, and either four or five subspecies. They are the largest living primates. The DNA of gorillas is highly similar to that of humans, from 95–99% depending on what is counted, and they are the next closest living relatives to humans after the chimpanzees and bonobos. Gorillas' natural habitats cover tropical or subtropical forests in Sub-Saharan Africa. Although their range covers a small percentage of Africa, gorillas cover a wide range of elevations. The mountain gorilla inhabits the Albertine Rift montane cloud forests of the Virunga Volcanoes, ranging in altitude from 2,200–4,300 metres (7,200–14,100 ft). Lowland gorillas live in dense forests and lowland swamps and marshes as low as sea level, with western lowland gorillas living in Central West African countries and eastern lowland gorillas living in the Democratic Republic of the Congo near its border with Rwanda. Gorillas move around by knuckle-walking, although they sometimes walk bipedally for short distances while carrying food or in defensive situations. Wild male gorillas weigh 135 to 195 kg (300 to 430 lb) while adult females usually weigh half as much as adult males at 70–115 kg (150–250 lb). Adult males are 1.5 to 1.8 m (4 ft 11 in to 5 ft 11 in) tall, with an arm span that stretches from 2.3 to 2.6 m (7 ft 7 in to 8 ft 6 in). Female gorillas are shorter, with smaller arm spans. Adult male gorillas are known as silverbacks due to the characteristic silver hair on their backs reaching to the hips. The tallest gorilla recorded was a 1.95 m (6 ft 5 in) silverback with an arm span of 2.7 m (8 ft 10 in), a chest of 1.98 m (6 ft 6 in), and a weight of 219 kg (483 lb), shot in Alimbongo, northern Kivu in May 1938. The heaviest gorilla recorded was a 1.83 m (6 ft 0 in) silverback shot in Ambam, Cameroon, which weighed 267 kilograms (589 lb). Males in captivity are noted to be capable of reaching weights up to 275 kg (606 lb). Gorilla facial structure is described as mandibular prognathism, that is, the mandible protrudes farther out than the maxilla. Adult males also have a prominent sagittal crest. The eastern gorilla is more darkly coloured than the western gorilla, with the mountain gorilla being the darkest of all. The mountain gorilla also has the thickest hair. The western lowland gorilla can be brown or grayish with a reddish forehead. In addition, gorillas that live in lowland forests are more slender and agile than the more bulky mountain gorillas. 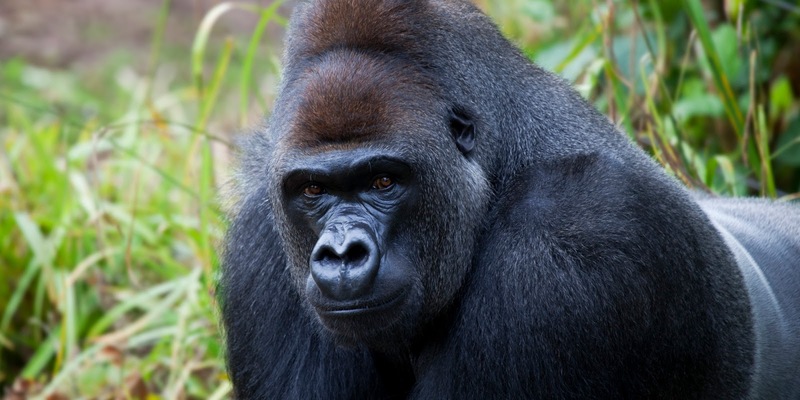 The eastern gorilla also has a longer face and broader chest than the western gorilla. Studies have shown gorilla blood is not reactive to anti-A and anti-B monoclonal antibodies, which would, in humans, indicate type O blood. Due to novel sequences, though, it is different enough to not conform with the human ABO blood group system, into which the other great apes fit. Like humans, gorillas have individual finger prints. Their eye colour is dark brown, framed by a black ring around the iris. A gorilla's day is synchronized, divided between rest periods and travel or feeding periods. Diets differ between and within species. Mountain gorillas mostly eat foliage, such as leaves, stems, pith, and shoots, while fruit makes up a very small part of their diets. Mountain gorilla food is widely distributed and neither individuals nor groups have to compete with one another. Their home ranges average 3–15 km2 (1.16–5.79 mi2), and their movements range around 500 m (0.31 mi) or less on an average day. Despite eating a few species in each habitat, mountain gorillas have flexible diets and can live in a variety of habitats. Eastern lowland gorillas have more diverse diets, which vary seasonally. Leaves and pith are commonly eaten, but fruits can make up as much as 25% of their diets. Since fruit is less available, lowland gorillas must travel farther each day, and their home ranges vary from 2.7–6.5 km2 (1.04 to 2.51 mi2), with day ranges 154–2,280 m (0.096–1.417 mi). Eastern lowland gorillas will also eat insects, preferably ants. Western lowland gorillas depend on fruits more than the others and they are more dispersed across their range. They travel even further than the other gorilla subspecies, at 1,105 m (0.687 mi) per day on average, and have larger home ranges of 7–14 km2 (2.70–5.41 mi2). Western lowland gorillas have less access to terrestrial herbs, although they can access aquatic herbs in some areas. Termites and ants are also eaten. Gorillas rarely drink water "because they consume succulent vegetation that is comprised of almost half water as well as morning dew", although both mountain and lowland gorillas have been observed drinking.